Yeah, that headline is real (and maybe the longest one I've ever used haha). 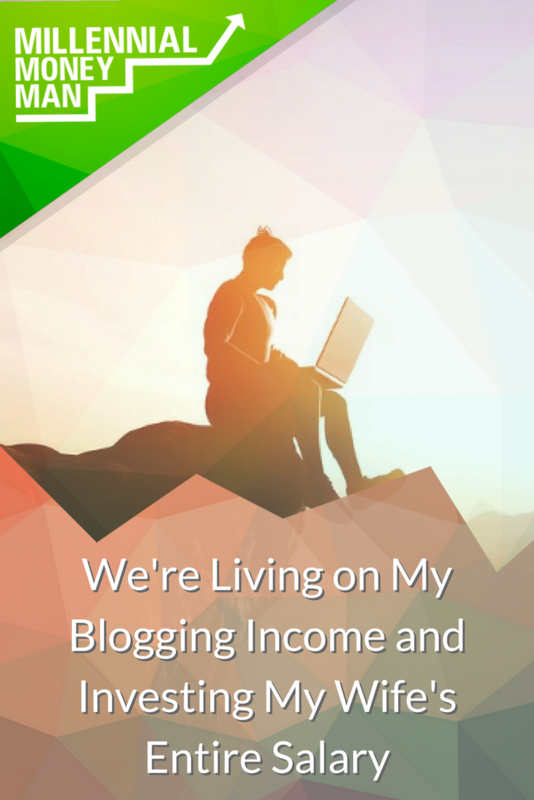 In the next few months, my wife and I are going to transition to living completely off of my blogging business income and investing her entire $55,000 per year salary. Even though it feels like I've been blogging about personal finance forever, the reality is that M$M is still a relatively new site in the personal finance world. I've only been self-employed for a little over 2 years now, which seems crazy when I sit back and think about the success I've been able to achieve so far. I'll get into the nuts and bolts a little later in this post, but first I need to explain that the biggest reason I've had any success with an online business is that I built it the way that I wanted to. Ever since I paid off my $40,000 of student loan debt in 18 months, I've been super passionate about personal finance. My idea of a good time is hanging out with people and talking about money and business, and that's pretty much it. That's why it's been easy to spend so much time building this site and its following, and I really feel like I've barely even started. You have to like what you're doing, or else it's not worth it IMO. I pound this concept on the site constantly for people who want to start a side hustle or jump into entrepreneurship. If you're just doing something for the money, you're going to hate it. I've talked about this with people who earn much more than me, and they always confirm the same experience I've had: Making more money doesn't equate to happiness. It just doesn't. So if the idea that money = happiness is what you're building your income streams around (whether it's your W-2 job or side hustle), you're screwed. For several months after I left my teaching job to run M$M, I wasn't making any money. Blogging is an incredible business model once you start actually making money, but it takes time! That's when I pivoted to finding digital marketing work with the skills that I had already picked up from blogging. A few months in, I managed to land a great client that hired me to run their website, write content, manage email campaigns, Facebook campaigns, social media, and more. That first client gave me a huge boost of income and allowed me to get even more marketing clients while I grew M$M in the background (I'm creating a course that will be available for purchase soon to teach you how to do the same…you can sign up below!). The real secret to success is what I did afterward: I laid low and limited the amount of money that I took out of my business. I wanted to keep as much money in the business as possible so I could grow exponentially in a short period of time. Being able to pay yourself in multiple ways seems complicated, but it's actually a great tax strategy that gives you a lot of flexibility. Rather than paying Social Security and Medicare tax on everything the company brings in, those taxes are only levied on the amount that I pay myself in salary. I don't believe that I'll need to rely on Social Security when I retire, so I have no issue keeping my contributions low there. If I get some money from it later…cool. I'll buy extra Metamucil and bi-focals with it or something. Lastly (and most importantly), I hired a great accountant to help me set up my business and give me high-quality advice. My wife and I will make well over $200,000 combined this year (if my business doesn't randomly fall apart), but we definitely don't live like it. For the first two years that I was building my business, Coral and I decided that we were going to keep our expenses to less than what she brought in every month. That gave me the flexibility to keep a lot of money in my business, which allowed me to pay for courses and grow my knowledge, experiment with Facebook ads, pay for good legal and tax advice, make upgrades to the website, etc. As the business has grown, we've basically stayed on that same spending plan. I've written a lot about spending less vs. making more on this site, and they are both really important. But, I think that if you're starting a business, you have to have the “spending less” part of the equation down. If I had just pulled all of the money out of my business, I'd probably still be making $3,000/month instead of $10,000-$20,000. Sticking to our frugal roots while learning to make more money has exponentially increased our freedom. Before, we were just using the money that came in from my business to add to savings for a house and max out my retirement. I paid myself $1,800 per month for almost two years, but on the advice of my accountant have bumped that number up pretty significantly to keep up with the businesses' growth. The next step is to switch over to paying our monthly expenses with my salary from the business, and use Coral's entire salary to max IRA's, an HSA, and dump the rest into our brokerage account. Ultimately, it all comes back to the decision I made years ago to pay off my student loans as quickly as I could. Without that, I wouldn't have had a story to tell, and I wouldn't have the discipline I needed to grow my business. Right now, we're taking a big step…but we're also just getting started. If you could invest your entire salary, what would you put it in? Living on one income is such a smart strategy, and in your case, I like the idea of investing your wife’s salary, because it will not fluctuate as much as yours will (I’m assuming). If you invest her salary each month into good mutual funds you guys will very soon be millionaires and open up many new options for your family (including new(er) cars, a new home, etc.). I wish my wife and I had followed this path when we were younger. Unfortunately, in our case we spent everything we both earned (yes, we are recovering spendthrifts!). But we’ve seen the light now. Living on just one income is the way to go. It’s going to be a cool transition! Based on where the business is now and how much I pay myself in the form of salary, we still have a big cushion for fluctuation. The plan is basically to dollar cost average ETF’s with her salary and also pick some individual stocks along the way. Incredible – this is the awesome thing about two working spouses. I wrote about it recently, and we’re doing the same thing (though my income is from my consulting job, at the moment). Since my consulting gig is hourly and will end in November, we’ll need to figure out what to do. In an ideal world, we’d live off of the wife’s income and save 100% of mine; partly because it’s variable, and partly because it’s more. We’ll max her 401(k) and both of us will max IRA’s. I have some gnarly fees on my retirement plan through work so we’ll likely not max it regardless but just live off of ours. I’ll at least max an IRA and HSA. Regardless, this is an awesome milestone for you guys to achieve. Congrats!! Thanks! Yes, two incomes helps a lot when you are starting a business. I wouldn’t have been able to do this if she wasn’t so cool about keeping our expenses so low. Awesome post and great info! Excited to see where things do with posts on investing. Do you have a plan on what all you’ll be investing in? Index funds, mutual funds, real estate, etc? For now index funds and individual stocks here and there if I see good value. Long term (and when the site makes more money), I’d like to get into commercial real estate investing as well! This is awesome to see how exponentially things have changed for y’all! Thanks to prudent financial planning, we’re now able to live completely on Mr. Picky Pincher’s salary and use all of my (higher) salary to pay off debt. It’s been AWESOME. I tried picking individual stocks in a self-directed Brokerage account. I’m sticking to mutual funds and index funds. Good luck on your investments. Awesome! We live on less than 50% of what we make. Sadly, we don’t invest it all. We put some in savings and another portion towards our mortgage. But we do invest a fair amount (with Vanguard). Congrats! Ah that’s so cool that you do the same! That’s great that you guys will be able to live off one income and completely invest $55k! We’re basically living off one income, and doing investing from that one as well. Once we finish our house updates we plan to start paying off our mortgage and increase our investing through 401k and index funds. We’re already maxing out 1 Roth IRA and on track to max out the other Roth IRA (hopefully). Awesome work! Love that you have invested in yourself and the company to reach where you are today! I’m 100% in on ETFs for almost all my investing these days. Other than some Facebook stock I’ve been riding for a few years now I love the set it and forget it diversification I can get through ETFs. Great post, well done on the blog success & future course! This is so neat and inspires me so much. I love my job but really want to figure out another income stream. The thought of being able to live off of one income and invest the other is awesome! Congratulations to you guys 🙂 I hope you continue to post more about investing! Will do! 🙂 You should definitely get a side hustle going!!!!! Doesn’t have to be online – you can flip furniture or walk people’s dogs. So many ways to make money. Congrats, that’s amazing! Also, glad to see you’re paying yourself more. You deserve it! This is so awesome! It’s great that you and Coral have maintained a frugal lifestyle. Frugality may not make anyone rich by itself, but it can definitely help you achieve financial freedom faster. I just paid off my first student loan (a feeling incomparable to anything else!) and have ~$40K left to tackle. After that, I’ma save and invest like it’s my job! Congrats to you guys on how far you’ve come! The importance of finding tax-advantaged strategies can’t be understated! I also might take a small position in cryptocurrency. Taxes can eat you alive if you don’t play the game correctly. Congrats man! I am on the journey to pay off the student loans now too. Quite interesting it will take me around 18-24 months to do so depending on my spending levels. I’m looking forward to eventually turning my passion of personal finance into a smaller business instead of a hobby one day, and look forward to continuing learning tips from you. 55K straight into investment accounts – love it!! That’s great Bobby! Putting 55k a year into just investing is huge! I just gave my old friend the same sort of advice yesterday “try to live off one person’s salary and invest the rest.” Whether they actually do it or not, time will only tell. But congrats to you and Coral for hitting this achievement! If I could invest my entire salary, I’d put it into rental properties. My wife is an only child and her parents have a few rentals that continue to bring in income after my father-in-law retired. I’d want that kind of income stream and we could build off of what they started. They plan to pass it on to us and we can pass it on to our children. Keep things in the family! Bobby, I love what you’re doing here. I appreciate what you’ve experience and what you turned MMM into. I actually featured you in my post today because of it. Hello, sorry this is an out of the place question, but I was wondering where to start if I wanted to gain more financial knowledge so that maybe in the future, I can make a finance blog as well. I’m a still a student and have a lot of time on my hand to learn, and finance has always been interesting to me. Anything would help! Thanks! I believe maintaining a frugal lifestyle is key to having the freedom to pursue your hobbies. And if those hobbies bring in the big bucks, then WooHoo! As far as investing goes, I’m on the same page with Dave (comment above). My parents have also rented a couple properties over the years and it has helped our family a lot, financially! It’s not exactly passive income, since you have to deal with legal issues, problems with tenants, repairs etc… but overall real estate is a good investment. Congratulations on killing it! I still haven’t made the leap although I did switch to a less stressful job which gives me more free time to grow the business. Question for you – did you open a solo 401k for yourself? Congrats! Less stress is always better 🙂 You’re doing it the smart way! No I haven’t…yet. My accountant advised me to go that route if my income continues to rise, so I’ll evaluate after Q4 this year and make a call. This is great! Living off of one income and saving the other has been my goal for a while – first, there was debt to tackle and once that was paid off, I felt invincible. I’d been saving a certain amount of money each month, but I wanted to ramp things up. I got a new job in May and decided that it was totally possible to save 100 percent of my income so my husband and I could live solely off of his income. Three months in, we’re doing great and it’s so encouraging to see our savings building up! I love this lifestyle and I hope we can keep it up, although I’d like to have kids someday and feel that may make it harder to save as much. Congrats on this transition! It’s awesome! What I would do with her salary is max her 401K at the match of the company and then invest in real estate for passive income. 3. We have kept our expenses very low – that’s what I’m doing, too. I gave up my car (yes, you read that correctly) to make sure my biz could stay afloat as long as possible. A few tight months here will pay off astronomically in the long run. Love your hustle. Great post. This is such an inspiring post! I love that you and your wife have maintained a low level of expenses in order to maximize your future gains. I will keep your business strategy in mind. Also. I just listened to your podcast on DYEB and really appreciated your tips. Thanks for sharing! We’re doing something similar ish but 75% of my husband’s take home pay goes to the mortgage and extra principal on the mortgage. My salary covers all else! We’re happy with our retirement balance and monthly retirement contributions, so we’re focused on being mortgage free! what are you spending the other 80% of your combined income on? Lately? Our house that we just bought haha. But after we get that all furnished out I’ll just keep pumping money into brokerage accounts. Depending on how this next year goes for my business I’d like to dive into real estate investing as well. Such great advice, and congratulations on your continued success. Follow-up Question: What advice & strategy do you have regarding you and your wife’s decision along the way in selecting your accountant? Do you have fee-based service with him/her for continued meeting/advice outside of tax services? Also, do you both utilize a fiduciary or CFP as well? (Background: 255k combined gross income, highly student loan broke, attempting to prioritize investing while paying loans). The accountant was something I did as soon as I started my own business. I wanted to get everything set up and get an informed strategy going from the beginning. If I have a long conversation via phone (when I’m strategizing for the next year), he bills me hourly, and then there is his fee for filing at tax time. I don’t use a CFP – our investment strategy is really, really simple right now. Basically dumping money into index funds and maybe some individual stocks when I see one that I consider a good buy.